Despite many complaints by KCH based MW members about nobody wanted to fly into their airport, airlines are cutting or terminating service there etc, the numbers surprisingly proved otherwise. KCH overtook PEN back as Malaysia's 3rd busiest airport with a double digit growth. KBR was a total shocker to break through into the 1 million+ category. Kelate boleh sokmo! 1. The longest distance, time and not 100% Highway by road from KL. Hello! 2. A large number of successfull Kelantanese works in KL. I noticed the "NIKs" are well known for business skills. We have one with MH here right? 3. Pahamin ( A kelantanese) and it's links to AK may have created some sense of strong "Kelantan" connection to AK. 4. MH and the Wau logo, may have also similar vibes to the East Coast ( including Kelantan). The question here is KBR capable of accomodating such pax. volume? I don't think so; if not, what is the game plan? The plan to upgrade KBR has been announced. KUALA LUMPUR: TRC Synergy Bhd's unit Trans Resources Corp Sdn Bhd has secured a RM45 million contract to upgrade the Sultan Ismail Petra airport in Kota Baru. TRC said on Wednesday, May 19, its unit received the letter of acceptance from Wira Akil Holdings Sdn Bhd on Monday. "The letter of acceptance from Wira Akil is subsequent to an award being given by the Ministry of Transport to Wira Akil whereby TRC is named as the sub-contractor for the project," it said. 1 Terminal expansion? Which part... Departure Gates, Baggage Reclaim @ Arrival or Landside Area? 2 Increasing aircraft bays? Specifically Remote or Full Contact Stands? 3 Bay upgrades to Code D / E ? 4 RNWY expansion / upgrade? Is it just the Length or supporting TXWY ? The amount mentioned would not be enough for all and IMHO KBR desperately need all of the above. Believe MH need more than ‘5 star rating’, ‘Best cabin crew’ and BTP X to compete internationally. In my opinion, 2009 was a very important year for MH as it put their declining passengers number on the domestic market at KUL to an end once and for all. At around 4.4 million passengers, MH has finally reached its ideal passengers number and can now breath a bit easy as the numbers have now became stagnant, there would probably no more or very insignificant amount of passengers crossover from MH to AK. MH can now concentrate on growth once again. AK as usual, stellar as ever with (still) a double digit growth even after all these years. On the domestic front in KUL, AK is unstopped-able! Our domestic market in KUL is getting larger. Only 4,168 passengers shy away from reaching 10 million passengers. AK controlled 56% of domestic market shares in KUL while MH 44% in 2009. Edited by Mohd Azizul Ramli, 23 June 2010 - 02:35 AM. Wud be interesting to c the impact of SZB and FY in the above KUL performance within the Domestic Services. If MH/FY is considered as one group, they may be "regaining" some numbers. The other thing is the appox. 10 million total pax. wud also mean that every 1 in 2.7 Malaysians do travel in/out of KUL annually. Not Bad. ..... mean that every 1 in 2.7 Malaysians do travel in/out of KUL annually. Not Bad. Edited by Dr Frasier, 26 June 2010 - 01:51 PM. That would dilute the "1 in 2.7 Malaysians" ratio even further, no ? Ok let see. SZB recorded 819,840 passengers movement in 2009. Out of this, 670,336 (334,743 arrival + 335,593 departure) is for domestic sector. And SZB handled not only FY, but also Berjaya Air (and a few other Indonesian smaller carriers I suppose), but since Berjaya Air et. al. traffic is minimal, we can safely assume that all figures are for FY. AK is still the largest domestic airline in Kuala Lumpur (both KUL and SZB) by 500,000 passengers margin when compared to MH + FY. Market share of AK is 52% while MH + FY is 48%. I'm pleased to c that this forum is becoming better in analyzing facts and figures .... in no time we all should get an MBA - Masters in Business Aviation! If only this user could provide one! Syabas to all. BTW, the ratio mentioned of " 1 every 2.7" is a figure of speach when analyzing a statistical data. Please do not get overbored by it. As we are all well aware, KUL handled almost 30 million passengers in 2009. This figure makes KUL ranked as the 40th busiest airport in the entire world. KUL is also ranked 4th in South East Asia, after BKK, SIN and CGK. Chicago's O'Hare, which was traditionally the second busiest airport in the world since like forever, was knocked down for the very first time by 2 places by Heathrow and Beijing. Beijing is set to become a mega airport of the world with its ever double digit growth and already handling 65 million passengers. Dubai handled close to 41 million passengers, surpassing Suvarnabhumi and Changi for the very first time. Dubai is world's 15th busiest airport in 2009. Suvarnabhumi handled 40.5 million passengers and retaining its position as the busiest airport in South East Asia. Suvarnabhumi is 16th busiest in the world. Changi handled 37.2 million passengers, ranked 2nd in South East Asia and is the 21st busiest airport in the world. A surprise for 2009, Soekarno-Hatta broke into the top 30 ranking for the very first time, signalling Indonesia's future prowess in this arena. Soekarno-Hatta handled 36.5 million passengers in 2009 and is South East Asia's 3rd busiest and also ranked 23rd in the world. Data was compiled by GregPz of Skyscrapercity. Azizul's posted statistics do give a good overview of Airport Developments Globally. Now the next step forward is to analyse as a whole ( macro context) what increases airport travellers and what makes money. 2 BKK - Extremely good tourism as a nation. There's no need to advertise much. However recent events may compromise such scenario. 3 CGK - High population base with 1% are High Income ( works well for legacy and premium demand) and High propotion of "exported" workforce, this creates good volume of budget travellers. If we look at all of the above, Klang Valley lacks of High Income Society and we are more concentrated on Medium and Upper Medium Class Society. This favours more for budget travellers , but the volume is not as significant as the "exported" workforce. And yet we don't have enough volume to support a good premium base. That's y KUL is having difficulty to attarct Legacy carriers like QF, BA, AF ..etc. If say Malaysia transforms into a High Income society as inspired by someone, we should not have a problem in having a good premium base. Even as a HUB, a strong and good OD presence is highly essential. SIN works well for QF-BA as the local traffic could easily "fill in" the gap available. However, KUL and Malaysia's popularity in M/East has managed to offset some of our disadvantages and from the way it looks , it is a market that we can't choose to ignore. What more, these are mainly compromises of High Income Society and Upper Middle Class. We can also deduce that if the airport taxes are taken into consideration, MH group remains the biggest contributor to MAHB compared to AK in the Domestic Segment. I'm sure Internationally MH remains the biggest. *For AK's arrival, it's quite tricky as I believe the airport tax in BKI is MYR 6 instead of MYR 9 because AK is using the LCCT there. So based on this assumption, yes the MH group paid more airport taxes than AK for domestic sector in KUL and SZB. So based on this assumption too, the MH group paid more airport taxes than AK group for international sector in KUL and SZB. But it is just natural as the AK group is being charged with rates much lesser as they are using low cost airport facilities from MAHB. Now, the next logical thing to deduce is that based on the above, the proportion of expenses for the airport development / expenditure ( CAPEX and OPEX) should be based on such breakdown. Is that the case here? However, we must not forget the growth in numbers as such may influence the CAPEX determination. The next question would be to what extend that justify such Airport CAPEX breakdown between LCC and Legacy Carriers? BTW, Azizul must have been taking a break watching Spain vs Germany that he was able to do such analyses at that time of the hour. I don't have tv access last night. 'Watching' the match through Emirates live podcast at fifa.com only. Beijing International Airport has overtaken London Heathrow as the world's second busiest, in a sign of China's growing dominance of international travel. 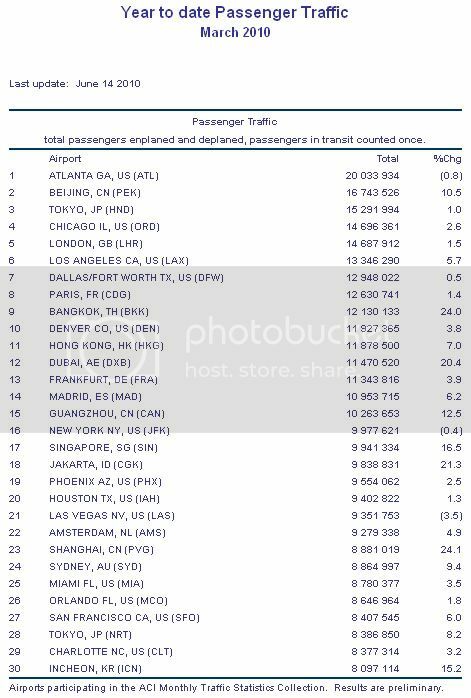 In terms of seat capacity, Beijing International is now second only to Atlanta Hartsfield in the US, according to a July 6 report by aviation analyst OAG. It seems the aviation sector is looking solid in 2010. Only 3 of the world's 30 busiest airports recorded a slight decline in passengers movement. Asian airports are dominant with double digit growth and also improving their respective rankings (PEK, BKK, DXB, CAN, SIN, CGK, PVG, ICN). Beijing is assuring its top placing with only Atlanta, the world's busiest airport since like forever, being the hurdle. Suvarnabhumi is South East Asia's busiest airport, ranked 9th in the world, up from 16th in the year end 2009 ranking. The competition between Changi and Soekarno-Hatta is getting more intense. Both airports are neck to neck at world ranking no. 17 and 18 respectively with only 102,503 passengers margin. Based on the growth percentage, Soekarno-Hatta is expected to topple Changi for the first time ever in history in no time, thus becoming South East Asia's 2nd busiest airport. Incheon finished at no. 41 in the year end 2009 ranking behind KLIA. They are now at no. 30 in the Q1 2010 ranking. KLIA is nowhere to be found. Naim, soon to be the busiest airport in the world, do u thk so? CGK is mostly domestic traffic though, right? With low-cost carriers booming all around, it'll be hard for SIN and KUL to compete against a nation which has more than 200 million people.